This petition has been created by Katy L. and may not represent the views of the Avaaz community. In 2008, The Zambezi Society, as a major stakeholder, was invited by Zimbabwe’s Parks & Wildlife Management Authority to participate in developing a 10-year Management Plan for Mana Pools National Park, a UNESCO World Heritage Site. Planning for future tourism was an important component of this Plan, and the Society, along with other stakeholders, played an active role in its process and formulation. However, although completed to the satisfaction of the stakeholders, there have been delays in signing the Park Plan into legislation (it remains a draft document). Meanwhile, a number of controversial tourism development proposals for Mana Pools, contrary to recommendations of the agreed Plan have been fast-tracked without the necessary consultations – a situation unacceptable to the Zambezi Society. Not only will these developments inevitably increase tourism impacts on the already-impacted and fragile alluvial eco-system of the Mana Pools floodplain, but restrict public access to popular and scenic places like Mana River Mouth. An Environmental Impact Assessment (EIA) for one of the developments (Mana Pools Safari Camp, situated at Vine Camp) has been undertaken and approved by the Environmental Management Agency (EMA) and another one, for Nkupe Camp is underway. Vine Camp is an area of dense and diverse fauna and flora, with magnificent alluvial woodland covering the banks of the river. Within its precious woodland are vast specimens of very ancient Zambezi fig trees, Natal Mahoganies and River Litchis, rare climbing lianes such as the beautiful “Tail-less Tailflower”, and other species special to the Zambezi “alluvial floodplain”. 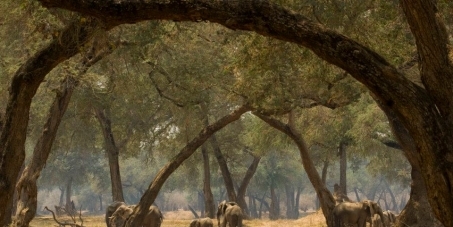 The woodland is a favoured spot for elephants, for the predators that Mana Pools is so famous for, such as lions, wild dog and leopard, and for a host of other wildlife species. It is the opinion of The Zambezi Society and professional reviewers of the Vine Camp EIA (who were not consulted as stakeholders during the EIA process) that, as a result of selective and limited background research and consultation, the baseline data and impact mitigation measures for this EIA are shallow and lack detailed understanding of: (i) the biological significance of the project site, (ii) the value of its natural and wilderness qualities to international tourism, and (iii) the potential long‐term damage of its impacts to the ecosystems in the area. In addition to these construction plans, and more worrying, is the current proposal for mineral prospecting, as the mining company GeoAssociates has been granted prospecting licences. Prospecting/exploration licences have been granted (Sept. 2011) to GeoAssociates, a locally owned company to undertake exploration activities for Heavy Mineral Sand Deposits (HMSD) in Ruckomechi and Chewore rivers. The licenses cover an area from the escarpment to the Zambezi River (45km for Ruckomechi and 65km for Chewore). According to Mr. Chimbodza, the Zambezi valley was chosen due to its richness in HMSD, as well as the fact that there would be no clearing in the river and that the company is aware that the Ministry of Water is in the process of desilting rivers in the country, so the proposed project would be in line with that. He says that this will be the first mining of this kind in Zimbabwe. The company also presently mines gold, industrial minerals etc in different parts of the country. The Zambezi valley is the most abundant area in terms of HMSD and this is where they intend to mine. They are not considering alternative sites for the project. The local mining company has external partners (investors) who insisted that an EIA be done. The consultation process however is becoming more complex than the company anticipated. The EIA consultants are Impact Assessment Consultancy (IMPACO), and the focal point is Mr. Itayi, contact details (0772264107; 0775884176; email: [email protected]). Here are email addresses of people involved in the Mana Pools developments. We are therefore requesting you to sign this petition in order to urge EMA to rescind the authorisation they have given for this development and for them to insist on a new EIA, of adequate standards, that match the important global value of the proposed site. Please also visit us at: http://www.zamsoc.org/ or The Zambezi Society on facebook. Thank you for your support! > Zambezi River (45km for Ruckomechi and 65km for Chewore). > abundant area in terms of HMSD and this is where they intend to mine. > 0772264107 or 0775884176; email: [email protected]). > to the international community as a whole”. > the legal and technical issues pertaining to this proposed venture. > the committee is in the process of investigating the situation. > any comments and suggestions that you might have on this issue.